Nearly two years ago jetBlue debuted its Mint premium product, which was a bold move for a low cost, hybrid-like North American airline. The company is the only low cost airline in the Americas that offers a dedicated premium product, and the success of Mint has even surprised jetBlue’s senior management. In an increasingly vanilla US marketplace, largely driven by Wall Street analysyt demands for short term profits, Mint’s success has beaten jetBlue’s own expectations, and now the airline is planning a massive expansion of Mint routes from its three largest bases – New York, Boston and Fort Lauderdale. jetBlue is undertaking the spread of Mint as Alaska and Virgin America work to gain approval for their merger, then to embark on a years-long integration process of the two. During that time jetBlue will leverage its strengths to inject a premium product into some of Alaska and Virgin America’s important transcontinental markets. There is much for jetBlue to digest as it works to roll out Mint in several additional markets. But with Mint’s current track record, jetBlue is not surprisingly remaining open-minded about its scope. Mint was conceptualised by jetBlue as a mechanism to capture revenue that it was losing to competitors on key and competitive US transcontinental markets between New York JFK and San Francisco and Los Angeles. During the past few years the three large US airlines – America, Delta and United – have introduced lie-flat seats in those markets, while Virgin America had a dedicated first class with reclining seats, which is now arguably obsolete. That left jetBlue with an all-coach cabin – an undesirable product for routes that garnered ample levels of high-yielding business travelers. The Mint cabin on a dedicated fleet of 11 Airbus narrowbodies features 16 flatbed seats, four of which are closed-off private suites. jetBlue’s price point on the product is lower than those of the three large US network airlines, but that still allows jetBlue to enjoy a revenue premium of its own. “If you think back to jetBlue before Mint, our margins between New York and Los Angeles and San Francisco were well below the system average,” the jetBlue CEO, Robin Hayes, recently said. “We were faced with a choice of either significantly reducing capacity in these markets or even pulling out unless we fixed those results”, he added. In Apr-2016 jetBlue executives stated that its routes between New York JFK and Los Angeles and San Francisco during the last 12 months had generated double-digit revenue each month. During early Apr-2016 jetBlue increased Mint fares in those markets by between USD25 and USD75. During the last two years Mint has been a market disrupter. Mint’s success was arguably one reason why United decided to drop premium service from JFK to Los Angeles and San Francisco and consolidate all of its premium transcontinental service at its Newark hub. The transition by all of its transcontinental competitors to lie-flat seats also made Virgin America’s once innovative first class look outdated, and after Mint’s debut Virgin America felt some pressure on its financial performance between its two largest routes from New York to Los Angeles and San Francisco. 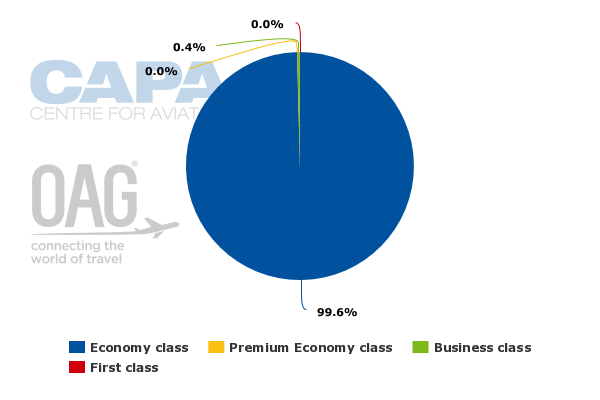 At one point Virgin America estimated that jetBlue represented 17% of the premium seats in the JFK-Los Angeles market, and fares had dropped 30% to 40%. 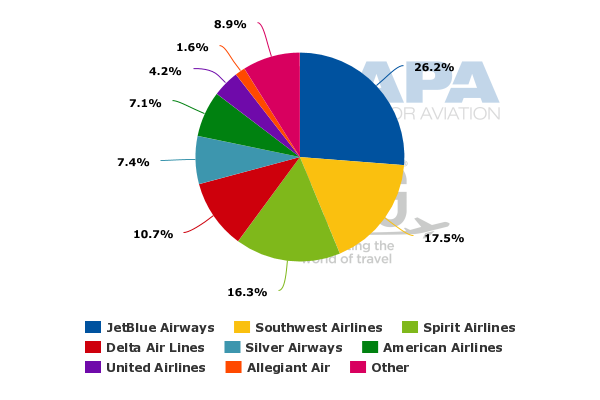 Data from CAPA and OAG show, for the week of 9-May-2015 to 15-May-2015: 3,378, or 0.4%, of jetBlue’s departing one-way system-wide seats are dedicated to its business class. Since Mint’s initial debut in New York transcontinental markets jetBlue has bolstered Mint frequencies between JFK and Los Angeles and San Francisco, and also added Mint flights from Boston to those cities. Almost immediately after Alaska Air Group emerged as the winner against jetBlue in the bid to acquire Virgin America, jetBlue rolled out a blueprint for Mint’s expansion in the 2017 to 2018 time frame. Seattle, San Diego and Las Vegas are being added to Mint’s route roster from New York, and new Mint service is slated to start to Seattle and San Diego from Boston. The airline is also adding Mint flights from its third largest base, Fort Lauderdale, to Los Angeles and San Diego. 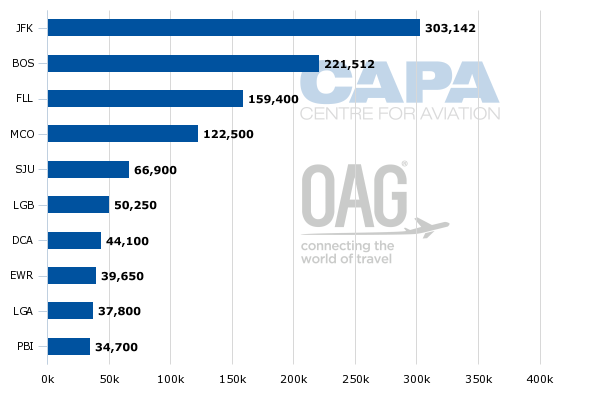 The planned route additions will result in the Mint subfleet growing from 11 aircraft at YE2015 to 26 by YE2017. Of those seven new markets, either Alaska or Virgin America operates in four. As those two airlines become entrenched in merger integration (assuming they gain requisite regulatory approvals for the tie-up), jetBlue will usher in a new premium product on those routes. Neither Alaska nor Virgin America has a business class product that rivals Mint, and previously Virgin America has concluded that the financial case to add flatbed seats to a subfleet of its Airbus narrowbodies was not strong enough. Perhaps with Alaska’s financial strength there could be a product overhaul, but that would take years to complete, giving jetBlue a first mover advantage as its raises the competitive bar in those markets. After jetBlue highlighted its planned Mint expansion it fielded questions about the product’s viability in some of the new markets. Boston and Fort Lauderdale obviously do not generate the same levels of corporate demand as New York transcontinental markets. The EVP commercial and planning, Martin St George, recently explained that when jetBlue talked with its corporate account base in Boston about Mint, three or four years ago, the overall response was that those clients were not interested in the product. “Two years later, they’re saying to us, hey, that Mint service, we kind of want that,” Mr St George said. Mr St George stated that small and medium business passengers, leisure travelers and some large corporate passengers had been strong contributors to Mint’s growth. The company feels comfortable that it will garner demand from those segments in the new Mint markets. 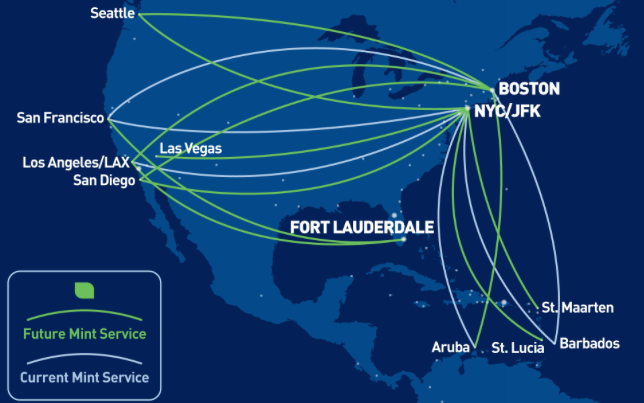 Fort Lauderdale may seem the most far-fetched of jetBlue’s new planned Mint routes – given that it generally does not have as large a corporate base. But Fort Lauderdale is one of jetBlue’s fastest growing markets. During the next few years the airline plans to grow Fort Lauderdale to 140 daily flights, which is 75% above current levels. Given its current and planned scale at Fort Lauderdale (it represents 26% of the frequencies at the airport), jetBlue has an opportunity to target customers looking for a more upscale experience, at the right price point, on transcontinental flights from Fort Lauderdale. jetBlue recently advised that it had far surpassed the conclusions that it had drawn in the initial business case for Mint, which is a laudable accomplishment for a product that is just two years old. The next chapter of Mint holds much intrigue, for jetBlue and its competitors alike. The planned new routes for Mint could yet demonstrate the demand for a premium product in markets whose passenger mix is more diverse. It could also usher in a new set of passenger expectations for premium service in the US domestic market.